The trio of planets gathering with the moon in the western sky Aug. 12, 2010, just after sunset. On Aug. 13, the moon will slide to the left and slightly higher compared to this view. 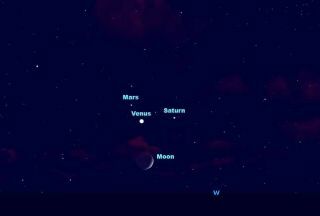 On Aug. 11, the planets will be I roughly the same location but without the moon. The planes will remain in a tight formation through the weekend but will be lower and lower in the sky each night. Update Aug. 13, 8:33 a.m ET: See our Perseid Observations story here. The peak of the 2010 Perseid meteor shower has passed. It was a strong peak. Additional meteors should be visible Friday night and Saturday morning. "On Saturday night, one bolide lit up the field,"
This story was corrected to reflect the fact that 20 meteors per hour equates to one every 3 minutes.